The summer time makes me nostalgic. I remember spending many a summer morning glued to my television set with my best friend, and neighbor J. What were we watching you ask? Each morning, we would choose to get up earlier than most children our age and meet up to catch Little House on the Prairie. Together, we would watch the episodes about Laura Ingalls and her life over and over. We watched as Half Pint grew up into a teacher and had children of her own. It was a time that we could relax, enjoy and dream of a simpler time. To this day, if I see Little House on the Prairie on television the theme song, familiar faces of Melissa Gilbert (Laura), Michael Landon (Pa), Karen Grassle (Ma), Scottie MacGregor (Mrs. Oleson), Richard Bull (Mr. Oleson), Jonathan Gilbert (Willie Oleson), Alison Arngrim (Nellie Oleson), Dean Butler (Almanzo Wilder), Victor French (Mr. Edwards) I always stop to watch. 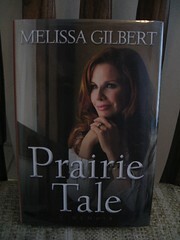 When I heard that Melissa Gilbert had written Prairie Tale – A Memoir I was intrigued. Over the years, I remember hearing a lot about Melissa’s life growing up in the spotlight. I wanted to read the book because it would allow me to see the person behind the characters that she had played on television in Little House and countless other movies. A fascinatiating, heartbreaking, and ultimately uplifting tale of self-discovery from the beloved actress who earned a permanent place in the hearts of millions when she was just a child. To fans of the hugely successful television series Little House on the Prairie, Melissa Gilbert grew up in a fantasy world with a larger-than-life father, friends and family she could count on, and plenty of animals to play with. Children across the country dreamed of the Ingalls’ idyllic life — and so did Melissa. I just finished Prairie Tale and have to say that I really enjoyed it. The book was not only a behind the scenes tour of life on the sets with Melissa Gilbert, but also about a woman who finally found a path in her life that she liked. Melissa wrote a lot about growing up on the set of Little House on the Prairie. It was fascinating to read about her close friendship with Alison Arngrim who played her nemesis Nellie on the show. I laughed at how she was upset with the casting of a "man" as Almonzo Wilder. I was also touched by her close relationship with Michael Landon and his family. Melissa even allows us into her thoughts about the time when Mike, as she called him, was dying from cancer. Melissa Gilbert’s life was filled with a lot of chaos during her late teens, twenties and even thirties. She abused drugs, was an alcoholic, and divorced her first husband. Of course, it was also during this time that she had two beautiful sons and found her soul mate in Bruce Boxleitner. Through the anecdotes and humor in the book, we see how Melissa finally realized her addictions and was able to get sober and become involved in Children’s Hospice and Palliative Care Coalition. A fun part at the end of the book was the list of alternative book titles that were suggested by her friends. I sat there reading them to my friend on the phone and we laughed hysterically together. Sharing these shows the comedic side of Melissa Gilbert. If you are a Melissa Gilbert fan, I would highly recommend this book because you will learn so much from this strong, courageous woman. One day I would also love to see Melissa Gilbert’s latest project, Little House on the Prairie, The Musical. During this production, Melissa is playing Ma to Laura Ingalls. If you have already seen this, know that I am very jealous! Did I ever tell you that the woman who is the receptionist at my company played Mrs. Alice Garvey on Little House? The character John Garvey’s wife….who died in the fire at the blind school. I loved that show when I was little! I too love the show an my sis and I are planning on going to the musical in tulsa in oct i think it is. As a lil girl I grew up wanting to be Laura, and even convinced my dad to make a detour on one family vacation to see the home she and Almonzo lived in in Missouri. It was an amazing little house We actually live about 2 hours south of Independence KS, and I had planned to take the kids this summer on a day trip from where we were staying but it turned out home is a lost shorter trip than it was from Sabetha. I will probably try to go up some weekend this fall before it gets too cool. I watched “Little House” ALL the time when I was growing up!!! A friend of mine in NYC posted a picture of himself with the lady who played Nellie! I always wanted to be Mary.